PROVO – Elijah Bryant, Yoeli Childs and TJ Haws combined for 61 points in BYU’s 95-88 win over Niagara Tuesday night at the Marriott Center. On the game, Bryant tallied 22 points and seven rebounds and Childs added 21 points and five boards. Haws contributed 18 points, six rebounds and six assists. Luke Worthington also scored in double-digits with 11 points. A dunk by Childs put the Cougars (3-1) on the board first, starting a 6-0 run to give BYU an early lead. After four scoreless minutes, Niagara (1-3) finished a layup and then went 5-6 from the field to take a 12-11 advantage with 13:06 to play in the first half. Dalton Nixon scored his first bucket of the night and Zac Seljaas hit his first 3-pointer with just under eight minutes to go in the first half to tie the game at 20-all. Nixon continued by converting on a three-point play to give the Cougars a 23-22 advantage. The game was tied at 29-all with 2:04 left in the first half when Childs stole the ball and charged to the basket, scoring a layup for a two-point BYU lead, but a pair of free-throws by the Purple Eagles tied the game once again at 31-all. After multiple possession exchanges in the final minute of the half, Niagara took a 34-31 lead at halftime with a three-point conversion in the last two seconds. Childs led with eight points after 20 minutes of play. In the first half, the Cougars shot 46.4 percent compared to the Purple Eagles 43.3 percent. Worthington recorded the first bucket of the second half, but Niagara answered with a 9-2 run. 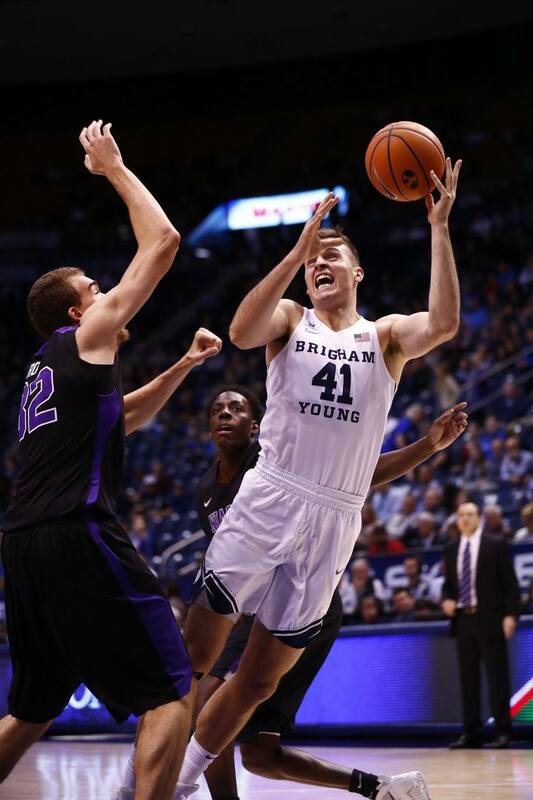 TJ Haws made five consecutive points to start a 10-4 run by the Cougars, giving BYU a 51-47 advantage. A 3-pointer by the Purple Eagles cut the lead back to one point. Free throws by Bryant and Haws and a three-point play by Childs gave BYU a 57-50 lead with 11:37 remaining. A pair of threes by Bryant and a Worthington jumper gave the Cougars a 75-65 advantage. Childs grabbed a steal for a dunk with two minutes remaining to give the Cougars an 85-74 lead. BYU ended the game shooting 9 of 12 from the line to secure the 95-88 victory. The Cougars travel to Brooklyn this weekend as they conclude the Barclays Center Classic. BYU takes on No. 25 Alabama on Friday, Nov. 24 at 12:30 p.m. MST. The game will be available to stream on Stadium College Basketball via Facebook and audio broadcasts can be heard on BYU Sports Network, BYU Radio (Sirius XM 143) and KSL 1160 AM/102.7 FM.